New York death metal lifers, Suffocation, came to Dallas last night on their final tour with original vocalist Frank Mullen. Bringing along with them the inimitable Cattle Decapitation and Brazilian death metal magicians Krisiun, it was a night the brought the Dallas metal scene out in droves. Considering it was 50 degrees, the Gas Monkey Bar n’ Grill is an outdoor venue, and local favorites Power Trip were celebrating their anniversary over at Canton Hall, it was an impressive crowd to say the least. I’m not sure the show was a sell-out, but I can’t imagine many more people squeezing into the venue. Cattle Decapitation @ Gas Monkey Bar n’ Grill. Photo by DeLisa McMurray. The opening set by Krisiun proved that this tour package has a lot to offer. Krisiun played a fantastic set and the band was committed to warming up the crowd for their tour mates in Cattle Decapitation and Suffocation. Vocalist/bassist Alex Camargo repeatedly tried to rile up the crowd between songs, though the songs were more than enough to get people moving. When Cattle Decapitation took the stage, the crowd was thoroughly warmed up. Vocalist Travis Ryan said the band had been writing new material when they got the call that this would be Mullen’s final tour and easily decided to join up for the occasion. Mostly playing material from their 2015 album The Anthropocene Extinction, with selections from 2012’s Monolith of Inhumanity, the band was as sharp and brutal as ever. Songs like “Dead Set on Suicide,” “Clandestine Ways (Krokodil Rot),” and “Forced Gender Reassignment” whipped the crowd into a frenzy. Ryan and his band mates never fail to amaze. While their albums are critically acclaimed and adored by their fans, their live set is as good as any of their peers. Guitarists Josh Elmore and Belisario Dimuzio complement each other perfectly and new touring bassist Olivier Pinard (Cryptopsy) seamlessly fills the void left by Derek Engemann. There’s simply no good reason to miss a Cattle Decapitation show. Suffocation @ Gas Monkey Bar n’ Grill. Photo by DeLisa McMurray. Suffocation took the stage a little before 10:00 and the crowd was ready to send Frank off in style. As the band poured through a 10 song set that spanned 6 albums, the mosh pit perpetually churned. Mullen told the crowd the set was comprised of his own selection of favorites from his time with the band and the audience felt the weight of his final performance in Dallas. 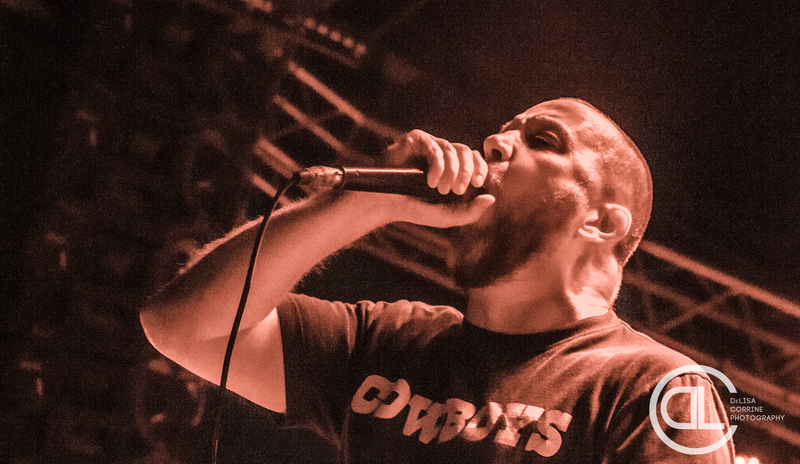 Between songs, Mullen frequently thanked the crowd and assured them that even though he was leaving, Suffocation would continue touring. Wearing a Dallas Cowboys t-shirt, he further endeared himself to the crowd by explaining that despite being from New York, he’s always been a Cowboys fan, and even called for the firing of head coach Jason Garrett to considerable applause. The band was on fire all night long. As their main set closed with “Liege of Inveracity,” from their 1991 debut Effigy of the Forgotten, the band easily was coaxed to return for an encore with chants of “Frank! Frank! Frank!” While this show could’ve been bittersweet, it was more of a celebration. The fans are going to show up for a Suffocation gig regardless of who is singing, but last night they were there to make sure Mr. Mullen knew how much he was appreciated. Based on how violent the pit turned and the roars from the crowd throughout the evening, there’s no doubt he knows how much he is loved in Dallas. Cowboys fan or not. Krisiun @ Gas Monkey Bar n’ Grill. Photo by DeLisa McMurray.